I saw this neat idea somewhere on the internet today. I didn’t think anything of it until I went to sew the strips together for the Bali Pop bag. So I do not have the link. 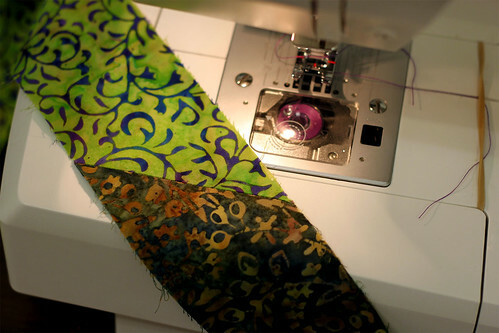 I browse so many sewing sites that I can’t even backtrack to find it. Sorry about that. This might be a very common thing for quilters to do. It is new to me though. The idea is to use an index card and sew next to it when joining lots of diagonal seams on strips. My strips are straight of grain, but I think it would be great for bias too. It was so easy to keep all my pieces lined up. I just put one selvage at a right angel to the selvage of the other piece, laid the index card where they intersected, and sewed along the edge of the card. I put the first strip face up under the pressure foot to hold it and then added the next strip on top face down. Finally I put the card in place and sewed. It worked so fast and kept all the 37 diagonal seams going in the same direction. I realize the light purple thread looks like the wrong color. I am having trouble deciding on a purple that goes with both the light and dark strips. I don’t want to have to change threads. This color was kind of in the middle, but I might have to find one that is more blue. 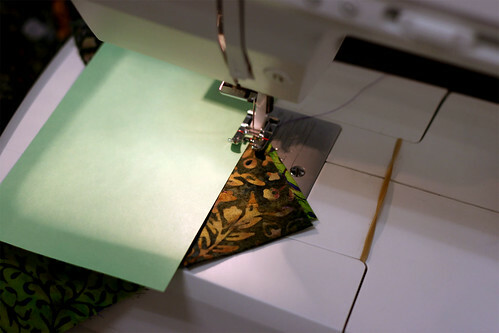 This entry was posted on Thursday, August 13th, 2009 at 3:00 am and is filed under Sewing. Tagged: Sewing. You can feed this entry. You can leave a response, or trackback from your own site.